I remember National Health Care being a hot topic of discussion at parties of recent graduates of Harvard in the early 1960s and here we are in 2012 and NPR morning news woke me this morning, still talking about the House trying to reverse President Obama’s National Health Care Bill for the 30th time. This is the one that has just been declared legal by the Supreme Court. 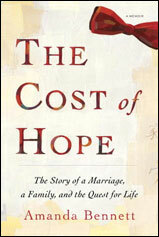 The book The Cost of Hope by Amanda Bennett is the story of the Health Care System in the United States and its cost for one couple as they move from state to state and different health care insurers for her career as a newspaper reporter and editor. I found her research into what she heard from doctors as a patient’s wife about her husband’s condition and what she learned as an investigative reporter about the condition fascinating. The different doctors’ discussions and conclusions for lab reports, that the patient never sees, gave a whole new light on the discussions with our doctors that we often think of as the definitive facts. We have bought about fifteen books on the topic of National Health Care recently, some just the facts, some opinions from both sides of the debate. If you want to learn more about it, read one of them such as: Remedy and Reaction: the peculiar American Struggle over Health Care Reform, or Health Care Reform Simplified or Health Care Reform : What it is, why it’s necessary, how it works by Jonathan Gruber. When was the last time you checked out the library’s children’s collection of non-fiction? Our collection covers a vast array of subjects and current events at reading levels for varying ages – from kindergarteners to high schoolers. Juvenile non-fiction includes EVERYTHING from biographies, crafts, cultures and folktales, gardening, poetry to recipes, sports, and even world records! Non-fiction also encompasses the facts on creatures with which we coexist, from domestic to wild and even the prehistoric varieties. Ever curious about an otter’s life? Or how long tortoises really live (and where) or what colors dinosaurs were? Non-fiction fascinates us with theories of the galaxy, the universe, the forming of the oceans, the world of insects, and infinite possibilities from many realms! Non-fiction contains history, biographies of heroes and fiends, poetry for all reasons. It is rich with cultural resources to help us understand our neighbors in the world both past and present. So much knowledge is custom-packaged for kids of all ages in the juvenile section. The library also has a specialized non-fiction collection for teens and young adults. This collection has a juvenile rating, but covers multiple subjects with a greater sophistication. The subjects featured are more advanced, encompassing subjects such as tattoos, acting/playwriting, eating disorders, fashion through the decades, art, and mythology. Come explore our world through the rows of non-fiction books available at your local library branch, and begin your virtual tour of so many worlds! 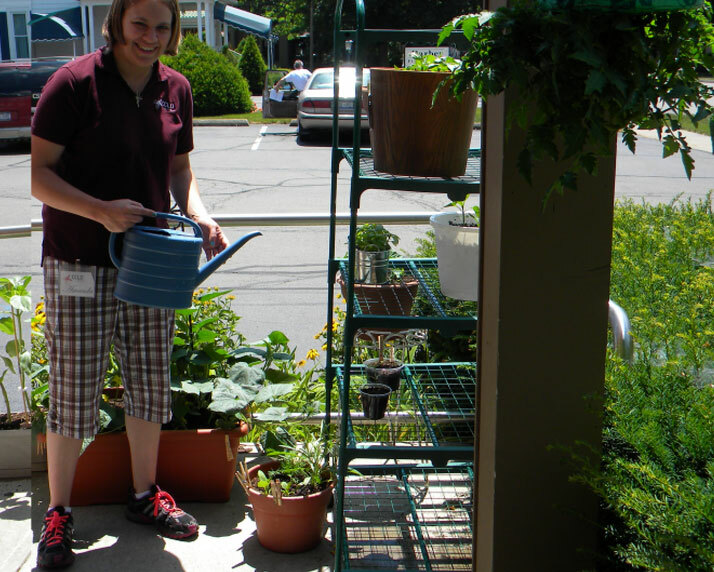 It’s Summer, and here at the Horseheads Library, we are bustling and blooming! Bustling with Summer Reading Club activities for kids and adults and blooming with our library garden. Late in Spring, my co-workers decided to have a children’s gardening program, based on the book “The Curious Garden” by Peter Brown. Kids who came to this program planted a variety of plants, including sunflowers, cucumbers, tomatoes, peppers and even their own chia heads. After a quick successful start in a miniature greenhouse, the plants were soon thriving, and our in-house gardeness extraordinaire (pictured here) got to work, transplanting, weeding and creating an outside garden spot for our bounty. This has attracted a lot of patron attention and appreciation as all want to know what we are growing, and more importantly what we will do with all of these goodies. So, at harvest time, we have decided to host a program where participants can come and sample some recipes using our produce, possible selections will include grilled pizza, a caprese salad, basil smoothies and cucumber soup. The date will be determined as we see how our garden grows, so be watching our website calendar for this and come and sample some of our wonderful garden fare, as our “Curious Garden” turns into an “Epi-curious Garden.” Also, new gardening books to check out include: “Grow, Cook, Eat” by Willi Galloway, Michelle Obama’s “American Grown: The Story of the White House Kitchen Garden and gardens across America”, and don’t forget our gardening magazines such as Horticulture and Birds and Blooms. Happy Reading and Eating this Summer! Last Monday morning, I came to work to find the elevator doors opening and closing constantly and refusing to move to the first floor, the reservation system for the public computers denying access to everyone, the library catalog refusing to tell anyone what books we had, and our library email not working so I couldn’t let our director know the state of confusion on the second floor. Then the phone started ringing with all the people who were notified that they had an eBook waiting and couldn’t download it! I had a sudden need for a sense of humor. I went to the 817 Dewey Decimal section where one finds humorous essays by writers like Nora Ephron, Lisa Scottoline, Dave Barry, Ray Romano and Paula Poundstone; I put up a humorous books display on the second floor. Erma Bombeck’s newspaper column use to put me in a good mood for the day, when she and I were both raising children; I can’t weed her books from our collection, as I’m sure there are still people raising children who need to see the funny side of everyday life. 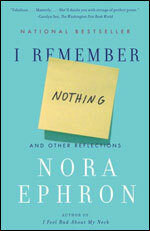 Nora Ephron died last week but her books on aging such as I Remember Nothing and I Feel Bad about My Neck are still amusing and are in large type as well as regular print. We also have DVDs of her movies: You’ve Got Mail and When Harry Met Sally. Lisa Scottoline’s Why My Third Husband Will be a Dog will bring a laugh. For the men; Ray Romano’s Everything and a Kite, Mike & Mike’s Rules for Sports and Life or any of Dave Barry’s numerous books should put you in a good frame of mind. Why not come and browse the entire 817 section or our display? You will be sure to find something to amuse you.